The KONG Biscuit Ball is made from high-quality natural and durable rubber, and allows you to hide various treats or healthy snacks inside. Dogs will enjoy trying to get the treats out of this ball. Your pet will have fun chewing and biting the natural KONG rubber, making dental care fun. 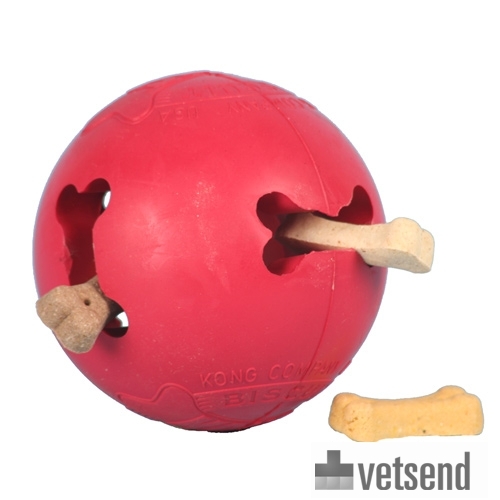 The KONG Biscuit Ball can also be used to stop dogs eating too quickly. This product is delivered without treats. The Large size is for dogs between 15-30 kg. It has a diameter of 9.5 cm. Have you used KONG Biscuit Ball before? Let us know what you think about this product.